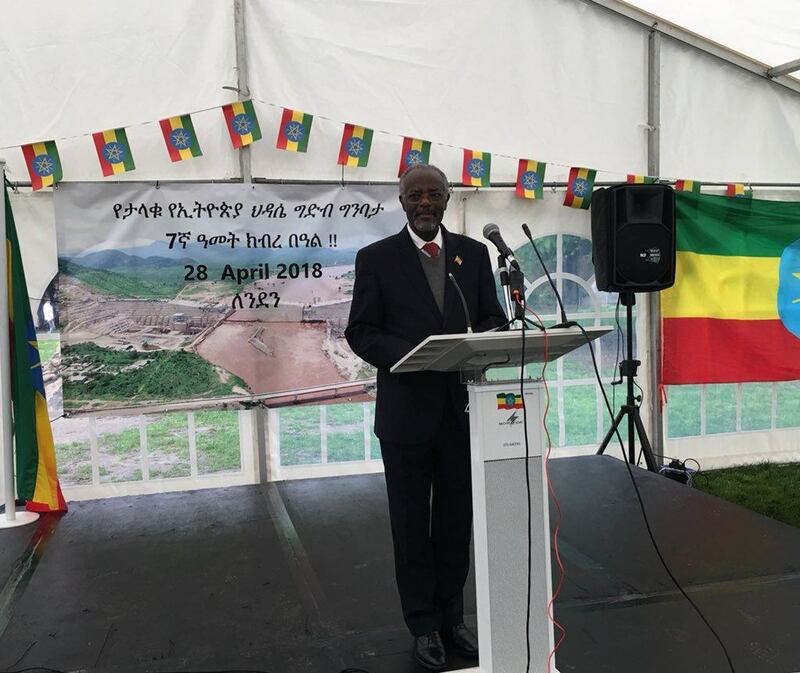 On 28th April, diplomats and members of the Ethiopian Community converged at the Ethiopian Embassy in London to celebrate the 7th anniversary of the construction of the Grand Ethiopian Renaissance Dam (GERD). In his speech, the Ambassador described the Grand Ethiopian Renaissance Dam as a “symbol of national unity” and “a Living Monument of Self Reliance”. He noted, since the day of launching the construction of the dam, Ethiopians from all walks of life including those in the diaspora community are supporting the construction in many ways believing the completion of the Dam would enable Ethiopia to become a middle-income country and foster and strengthen economic integration with neighbouring countries and beyond. The Ambassador noted that the construction of GERD has reached 66% and said: “as we mark the 7th anniversary of the launch of the construction of GERD, we are reminded that each day leads to more successes in making the finalization of the dam a historical reality”. Speaking about the role of the Ethiopian Diaspora, the Ambassador appreciated the community’s support and called upon them to scale up and intensify their all-around support for the grand project. On the day, the Grand Ethiopian Renaissance Dam Tombola Lottery tickets were sold, of which prizes include residential plots and money, apartments, condominiums and tours to different parts of the country and to the GERD construction site. For information regarding the Tombola Lottery, visit the Embassy or contact the reception desk. The $4.7 billion Grand Ethiopian Renaissance Dam, fully financed from domestic resources, is 66% complete. When complete, the 6,450MW dam will be Africa’s largest and is a landmark project signalling Ethiopia’s renaissance. In Ethiopia, the anniversary was celebrated in the presence of high level government officials, artists, and invited guests at the construction site in Guba, Benishangul Gumuz Regional State. Speaking at the event, Etenesh Mekuria, State Minister of Water, Irrigation & Electricity, said the dam will produce electric power but also cement national unity and reduce poverty. In addition to purchasing bonds, farmers have planted 4 billion tree seedlings around the dam to protect the ecosystem. Around 9,000 Ethiopian and 260 foreign workers are participating in the construction of the dam. Prime Minister Abiy Ahmed visited the site of the Grand Ethiopian Renaissance Dam on 1st May accompanied Deputy Prime Minister Demeke Mekonnen and other government officials, including the Minister of Water, Irrigation and Electricity, Dr Sileshi Bekele and Engineer Azeb Asnake, CEO of Ethiopian Electric Power. During their visit, the delegation was given an update on the progress of the dam by Engineer Simegnew Bekele, manager of the project. Following the visit, the Prime Minister addressed residents of the Benishangul Gumuz Regional State, calling on them to stand united to meet the targets set to realise a prosperous Ethiopia. The Premier also held discussions with representatives of the residents, drawn from all parts of the region, where he addressed various issues including investment and infrastructure development.